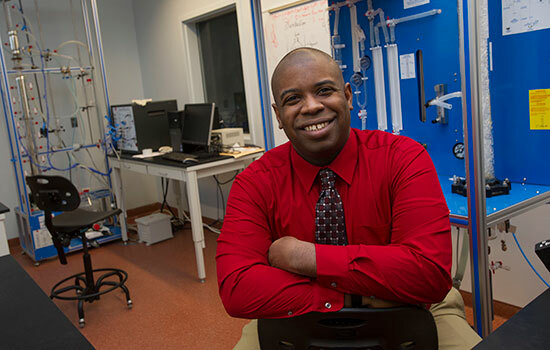 Reginald Rogers, an assistant professor at Rochester Institute of Technology, received the Henry C. McBay Outstanding Teacher Award from the National Organization for the Professional Advancement of Black Chemists and Chemical Engineers. He will receive the award at the organization’s annual reception on Nov. 2 in Minneapolis. Rogers teaches in the chemical engineering program in RIT’s Kate Gleason College of Engineering. The McBay Award is given to faculty members who have shown dedication to the profession through extensive research, commitment to the educational development of students and STEM initiatives. This is Rogers’ second recognition from the organization. In 2015, he was presented the Joseph N. Cannon Award in Chemical Engineering, given to distinguish the achievements of individuals in science, engineering and technology as well as to highlight role models of color in the STEM disciplines. Rogers, who has been at RIT since 2010, is an expert in lithium ion and sodium ion battery systems and adsorption using carbon nanotubes for environmental applications and chemical/biological sensors. His work has been published in multiple peer-reviewed journals, most recently with John-David Rocha, assistant professor of chemistry in RIT’s College of Science, about reusable carbon nanotubes for water treatment, and highlighted in Environmental Science Water: Research and Technology. In 2016, Rogers was honored with the Richard and Virginia Eisenhart Provost’s Award for Excellence in Teaching, one of RIT’s most prestigious awards for faculty. This award supports undergraduate education at RIT by supporting faculty who have taught three years or less in their pursuit of excellence in teaching and leadership in the campus community. “I am truly honored to have been selected for this award. Having learned about the history of Dr. McBay and his impacts on education makes this recognition truly exceptional,” said Rogers, who was also named Partner of the Year in 2015 by RIT’s Multicultural Center for Academic Success for his work both in and out of the classroom mentoring undergraduate students in STEM programs. He is also academic adviser for RIT’s chapter of the National Society of Black Engineers and several campus fraternities. Rogers came to RIT through the university’s Future Faculty Career Exploration Program, starting his career at the university as a postdoctoral fellow until hired as a tenure track faculty in 2012.